Well Said, Inc. is the award-winning company that teaches you and your team how to speak with more confidence, clarity, and credibility. Regardless of your current skill level, Well Said coaching optimizes your natural speaking ability, improves your proficiency, and develops the confidence you need to deliver high-impact presentations that get results. Being able to persuasively address a group of decision makers and positively influence their thinking is a key step toward achieving success in business. 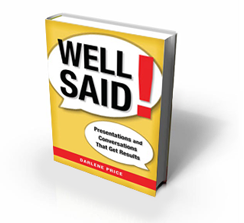 For over two decades, senior executives in over half the Fortune 100 companies have relied on Well Said’s presentation coaching to prepare them for critical audience-facing events. Our name is also our promise. Well Said will help you speak with confidence and connect with every audience. Well Said! Presentations and Conversations That Get Results is now available in Chinese!